A humorous look at doctors and their ilk by India's best-loved cartoonist Laughter, they say, is the best medicine. It is therefore fitting that the world's most honourable profession should have a great deal of fun made at its expense. Humour directed at physicians and medicine has sustained many a suffering patient through the bleakest of times. A Dose of Laughter is an exhilarating collection of cartoons and jokes about doctors and their practices that will bring a smile to the lips of those who wield the stethoscope as well as those who yield to it. 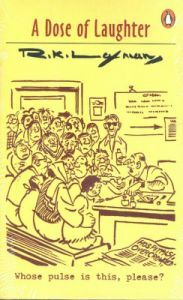 The book contains 100 cartoons about the world of doctors, hospitals, laboratories, ailments, maladies, health schemes and hygiene that show R.K. Laxman at his inimitable best. These are accompanied by a hundred of the funniest jokes about doctors and the medical profession collected from all over the world. Together these make for a witty, perceptive look at the unequal effort doctors make to combat disease and bring succour to their fellow humans. This is a book that can be dipped into at random, or read from cover to cover. In either case, it is guaranteed to provide a great deal of unadulterated merriment and laughter.